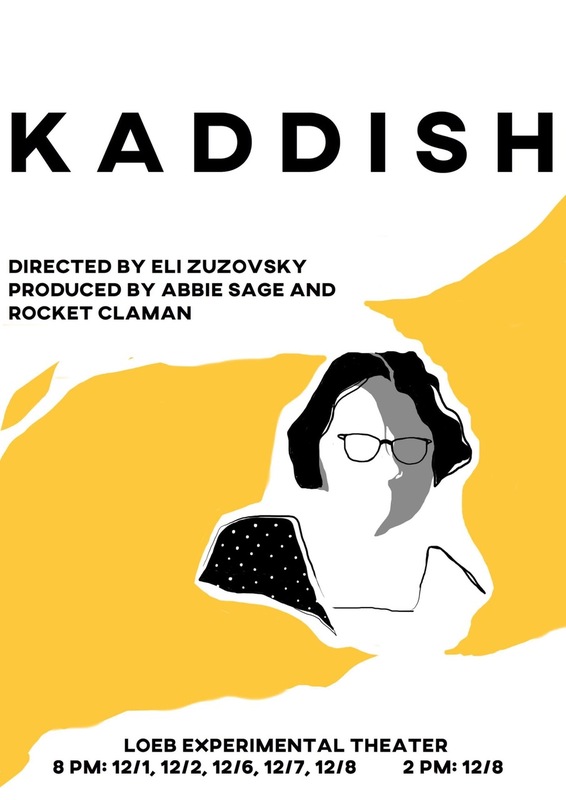 "Kaddish" premieres on Dec. 1 at 8 p.m. at the Loeb Experimental Theater. American poet Allen Ginsberg’s “Kaddish for Naomi Ginsberg” refers to the traditional Jewish prayer recited in memory of the dead. In the next week, a new, original adaptation of Ginsberg’s poem, directed by inactive arts editor Eli Zuzovsky ’21, will premiere at the Loeb Ex thanks to the cast of HRDC. Zuzovsky did not embark upon the task of adapting Ginsberg’s masterpiece lightly. “The challenge is that the text is not chronological. There are multiple leaps in time because it’s all about memory and the way we remember the people we love,” Zuzovsky says. To adapt this multi-layered, textured poem, Zuzovsky employs a variety of artistic and theatrical elements meant to convey chronology and meaning. The show follows Allen Ginsberg (John R. Creed ’19) as he interacts with four different Naomi Ginsbergs, each embodying a different element of her memory through Allen’s consciousness. “As the show progresses, we flow in and out of various memories and plot points,” Katie R. McClanan ’22 says, who plays one iteration of Naomi. Through these interactions, the audience sees Ginsberg grappling with issues he faced in his relationship with his mother and how mental health issues affected their interactions. The show attempts to examine mental illness through Naomi, who was never properly diagnosed and spent much of Ginsberg’s youth in mental hospitals. “He had to take care of her since the age of 12 and step up to be her parent, in a way,” Zuzovsky says. Other themes find themselves intertwined within the show, including Ginsberg’s stance on homosexuality in a time when it was illegal in every U.S. state. “The show is shining a light on how art can help people to process their grief.” Creed says. It does so not by creating a new pice, but by drawing upon a potent example of bereavement and breathing new life into the story on the stage. “Kaddish” will run on Nov. 30, Dec. 1, Dec. 2, Dec. 6, Dec. 7, Dec. 8 at 8 p.m., and on Dec. 8 at 2 p.m.